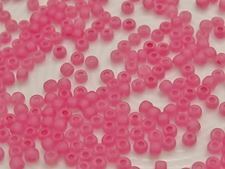 Whether it is for knitting, crocheting or weaving you will love how easy it is to work with Japanese seed beads size 8/0. It is also easier to string and combined with a smaller size they will offer you lovely and interesting visual results. In fact it is the ideal bead for kumihimo. There is no consistency in sizes, each manufacturer has its own norms. The same size number is in general slightly smaller for a Czech bead than a Japanese one.